Ptarmigan photo featured in Wild Planet's "Winter Visions"
Ptarmigan in its winter coat of white up on Cairn Gorm mountain in Scotland. Wild Planet is a high quality digital wildlife photography magazine that I have enjoyed looking at for a good while now. It was nice to be able to be featured alongside some other great winter wildlife imagery in their February issue. Paul Sharman, Peter Travers and Ben Hall. 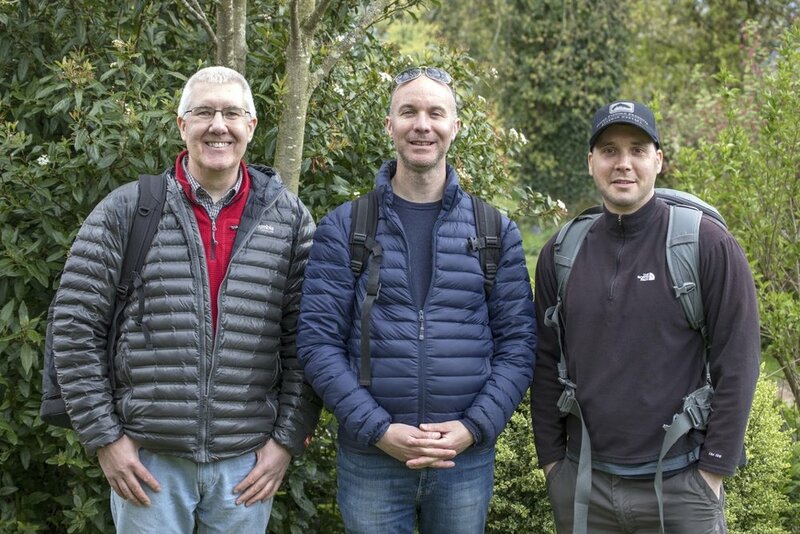 Earlier this year I spent a glorious day down near the Welsh border at the International Centre for Birds of Prey in Newent, Gloucestershire with the editor of PhotoPlus - The Canon Magazine, Peter Travers, and their technique editor, James Artaius. They had invited me down to be their 'apprentice' for the day, a regular feature in the magazine, and had lined up professional wildlife photographer Ben Hall to be my tutor for the day. It was a fantastic opportunity and Ben was a great teacher, fine tuning my settings and technique to make the most of the day's subjects. >>Here is the full feature, re-published with the kind permission of PhotoPlus. Alternatively - here is a quick scrollable version below to view just the photographs. I took advantage a while back of an online offer from the folks at Saal Digital of a voucher towards a wall product featuring one of my photographs in order to sample their work. That seemed like too good an offer to miss, so I picked out one of my favourite colourful garden images and used their simple online ordering software to place my order and pay the balance of the total after applying the voucher. I decided to try their 'acrylic glass' product as it promised "bright colours and fascinating spatial depth." I have had this on the wall for a few weeks now and have to say I am impressed with the overall richness of colour and have had some nice comments from visitors also so I would say that claim passes. The clarity and depth of the acrylic glass also certainly does add an little extra impression of depth to my photograph but I suspect a larger landscape scene with more depth from the foreground to background would benefit much better. There was a choice of 3 wall mounting solutions and I opted for the aluminium subframe, as seen below, as it helps keep the product off the wall at an even spacing from top to bottom which I like the effect of. It is an additional cost though. Choosing an alternative to the standard canvas or paper print is becoming a more affordable option nowadays for something different to display in your home, and costs will continue to come down as the novelty wears off and technology improves. Whether it be a print on aluminium or under acrylic glass like this one, it is worth experimenting to see what suits your images best. If you'd like a print of "Coneflower carnival" for your own wall, drop me a line via my Contact page and we can discuss sizes and options. Pleased I could donate one of my leaping sea trout photos to help publicise Professor Jonny Grey of the Aire Rivers Trust and WTT's Tim Jacklin's fundraising paddle up the River Aire following the fish's migration route from the sea 50 miles up river. 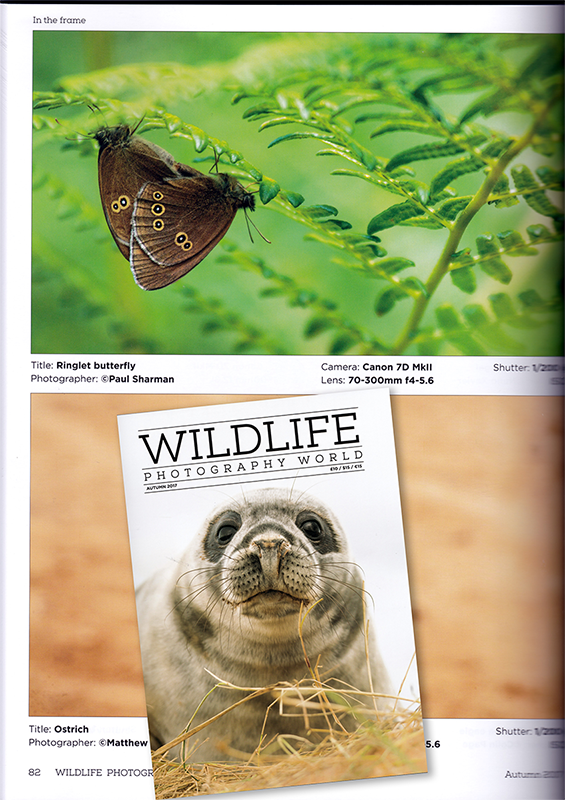 Very pleased to see my "Ringlet butterfly" photo in the Autumn 2017 issue of Wildlife Photography World. It was one of my favourite wildlife shots from last year, taken at the RSPB's Pulborough Brooks reserve in Sussex. I was delighted that the Inari-Saariselka Tourism office in Finnish Lapland wanted to use my local salmon fishing story in their official tourism magazine. It starts on page 24 (Salmon Fishing By The Light of the Midnight Sun) but it is worth flicking through all the magazine to see what a visit to Finnish Lapland might have in store for you! I can highly recommend it and I will be going back as soon as I can for more fishing and wilderness adventures. When I hatched a plan with Paul Procter last year to visit his main stomping grounds in the Cumbrian region of England, little did we both know what was to follow. Brown trout in the local rivers were the target but we could have never dreamed how the day would turn out, ending in his largest UK river trout ever. Paul wrote about the day's fishing in an exclusive story for Trout & Salmon Magazine's March 2018 issue and I supplied the photographs. I was invited by Orvis UK to test out their latest Helios 3 rods down on their beat of the River Test in Hampshire. I was not disappointed! I took this pair of Zeiss TERRA ED Pocket Binoculars up to Scotland with me for an extended field trial - perfect for slipping in a pocket or fishing bag. Fly fishing my way around the beautiful Inari-Saariselka area of Finnish Lapland under the midnight sun with Ville Kaipennen of Lapland Safaris looking for Atlantic salmon - Santa central come the wintertime, and its close Norwegian neighbour of Finnmark. One of my favourite shots from a trip to Pesca Maya lodge in Mexico's beautiful Ascension Bay. Pleased to see it getting some love from Hatch Magazine. The superbly marked cheek of a large Cumbrian brown trout. One of my all-time favourite photos features this year in the 2017 Salmon & Trout Conservation UK Gamefisher magazine on page 30 picturing Jeremy Lucas on the Upper Eden. I loved the way the river snakes off into the distance and the obvious concentration of an expert angler in action. Marina Gibson is a popular up-and-coming Orvis-endorsed fly fishing guide in the UK with a large and growing social media following who loves all sorts of fishing and getting new anglers of all ages into the sport. She is now a brand new member of the Bonefish & Tarpon Trust and will be sporting her new BTT shirt proudly on trips to Christmas Island and Belize this year. Photo courtesy of Patrick Camber. Earlier this spring, the inaugural 2017 London Fly Fishing Fair was staged over two days in the impressive main hall of London's Business Design Centre. As their UK representative, I was on hand to fly the flag for Bonefish & Tarpon Trust. Hosted by Orvis UK in their booth, I had plenty of interest in the work of the Trust, handing out a full box of BTT journals, membership leaflets and merchandise to UK fly anglers who stopped to talk, many of whom travel internationally to flats locations around the world. The international support for this new kind of consumer fishing show in the UK (New York’s Urban Angler, the Bahamas and several destination companies offering flats fishing trips were represented) was very well received by the public. The Fair is set to grow even larger next year with plans already underway for 2018. If you would like more information, please CONTACT ME. A strange catch of a fish with an extending mouth while on holiday in Thailand had me wondering what I had caught. The fish experts at SportFishing Magazine has me covered with the answer and a missed world record opportunity apparently! My contribution to Fly Punk, a cool new fly fishing ezine on its second issue now was a short article about adventure and destination fishing called "Fishing for Kicks." The 2016 Azores Airlines Big Game Fishing Tournament drew in teams from both sides of the Atlantic to these idyllic islands and the weather was much better than my last visit 2 years ago. Being on the winning boat meant I got to see and photograph the winning blue marlin for my article published in Saltwater Boat Angling magazine. I had been saving this favourite Snook image of mine for the right feature article to come along and was very pleased when top US title Sport Fishing Magazine used it splashed across a double-page spread in the magazine's October 2016 issue.